This study considers an airborne multichannel phase array radar consisting of an analog phase shifter on each channel, where the sum channel (output) is digitised using a single A/D converter. Generally for such a configuration, the array weights are predetermined for each transmit/receive direction and are nonadaptive to the clutter. In order to achieve any adaptivity to the environment, the convention is to split the array into at least two subgroups and implement two analogs to digital converters. A single A/D-based software solution (numerically stable, robust) is proposed to achieve the full sidelobe adaptation to clutter. The proposed algorithm avoids these engineering complications involved in implementing multiple A/Ds for radar applications while maintaining the same desired performance. As a large number of airborne radar platforms already exist worldwide, the possible applications of this proposed fully adaptive upgrade as a software solution can be huge. The objective of an adaptive array is to combine the elemental outputs, appropriately weighted so as to generate an output that is interference free. To achieve this we need to have observations from a sufficient number of channels of the array that we can use to calculate the adapted weights [1–3]. If a "traditional" analog beamformer is employed, then it is not usually possible to observe the individual channels. If multiple beamforming manifolds are used, it is possible to compute an adaptation in beamspace, but in most cases only a small number of beams are produced severely restricting the number of interfering sources that can be accommodated. In practice this is further complicated because "real" arrays, especially with near-field scatterers, do not have uniform elements. There are a number of engineering advantages to employing an analog beamformer, particularly related to the number of digitisers employed and the consequential simplification in all those processes associated with digitisers (maintaining alignment, power consumption/cooling, and data management), but if low sidelobe performance is required, this is offset by the increased difficulty in calibration of the array, especially for active arrays, where effective impedance of path depends upon the frequency, power on/off, and phase status of adjacent elements. Current capabilities are such as to favour the use of analog beamforming to produce a small number of beams, typically a single sum, also known as a "sigma" beam, and additionally a number of difference beams, also known as "delta" beams, and then either (a) sacrifice low sidelobe performance; (b) require complex calibration; or (c) attempt to mitigate the sidelobes with limited adaptive processing, such as "sigma-delta" processing  or other forms of reduced-dimension adaptive processing. This study considers a phased array wherein we can adjust the amplitude and phase of each element, but where we can only observe the output of a single "sum" channel, and introduces an algorithm on this channel to adaptively null any residual sidelobe clutter. The method described in this paper transmits pulses in each beam direction. Firstly coherent burst of pulses are received using an initial set of antenna weights. Then, after allowing for a switching delay, a second burst of pulses are received using a set of weights that are linearly independent, whilst satisfying certain requirements. 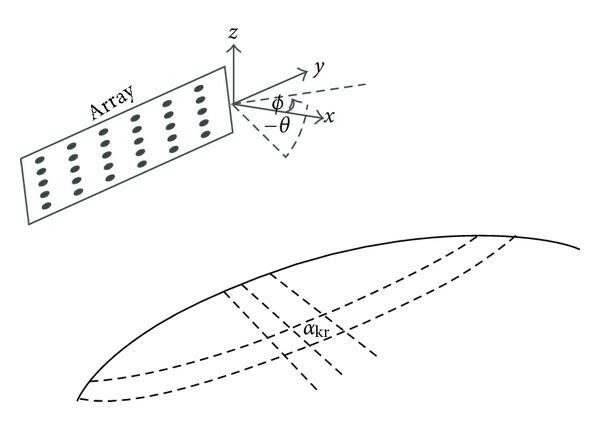 The new algorithm developed in this paper uses the properties of the data stream to adaptively null the ground clutter with degrees of freedom. The procedure we have developed is tested using both simulated data and data from the MCARM system , suitably processed to represent a single "sum" beam, including the delay caused by the switching of the antenna weights. The results obtained are then compared with the fully adaptive solution available via mutlichannel data with the same number of degrees of freedom. This paper is organised as follows. In Section 2, we formulate the standard multichannel problem and consider multichannel observation-based signal processing gains (full STAP, beamspace STAP, etc.) to provide a baseline for comparison. Section 3 formulates the proposed software solution using a single observation channel and derives the signal processing gain. Section 4 examines the theoretical performances and compares the algorithms using Monte Carlo simulation. Finally Section 5 uses MCARM data to validate the results. where and w represents the received weights vectors which are chosen to satisfy . The simplest beamforming choice is the uniform weights given by , and here we have ignored transmit pattern effect. The above data stream is then passed through a Fast Fourier Transform (FFT) processor to obtain the output for each Doppler bin of interest. In the presence of clutter the performance is reduced severely. Airborne array with axis system. In order to achieve full adaptivity to the clutter, generally the radar system has to undergo a multiple-A/D (hardware) upgrade where a number of sampled data streams are made available. However, for practical implementation, typically one would apply some of the degrees of freedom nonadaptively via Pre Doppler STAP, Post Doppler STAP, or Beamspace STAP, in order to simplify the computations and inversion of the covariance matrix. This will not lower the performance significantly of the system providing the number of adaptive degrees of freedom sufficient to null the number of interference signals present in the system due to clutter-related arrivals, and the results are well documented in the literature[1, 2]. where is the number of range cells used for averaging. It should be noted that is equivalent to full STAP solution requiring an A/D for each channel, which allows us to use adaptive degrees of freedom. N-Channel receiver configuration with two pulse bursts. where , with . The vector can be considered as the secondary receivers spatial component of the steering vector of size which is synchronised to the same coherent clock as the first transmission. This is equivalent to the original spatial steering vector, but, it is a function of the angle of arrival, the Doppler frequency of interest, the switching delay, and the pulse repetition interval, related to the target or clutter patch of interest. Just as we avoid the spatial ambiguity by restricting our array spacing to half-wavelength, we can avoid this ambiguity by restricting the switching delay to less than one PRI (= ), because, in order to avoid Doppler ambiguities, we already have the restriction of possible Doppler frequencies to ). In any case, if one ever needs to resolve this ambiguity, the next possible value of the switching time is ( ), for some . A procedure is developed later to estimate the switching time delay very accurately subject to the above ambiguity. where is the receive patterns ratio with the property , is a combined weights matrix of size , represents a independent random entries, and is the matrix of zero entries. where  are (weights) easily obtainable by equating the coefficients of the above product which is of order polynomial in . These are the weights for the second receiver. Large value of for the pattern ratio forces us to switch off too many elements at the first receiver. In order to predict the performance of the MTR-STAP algorithm with the nonadaptive single A/D-based-FFT solution, as well as potential multichannel upgrades, we would like to establish a theoretical space-time clutter covariance matrix for each case using the parameters similar to MCARM system. Consider a 22-channel half wavelength equispaced airborne array with PRF = 1984 Hz, , m/sec, , and The estimation of the clutter covariance matrix was carried out using two methods. The continuous model described in  and another straightforward discrete method is to first determine a value for (≈ ) as the desired clutter degree of freedom. The discrete method considers a series of angles of arrivals to represent each Doppler bin of interest by using the equation (the ridge) = . This equation provides us with a series of clutter angles for generally close to the figure . This procedure creates nonuniform patches on the ground, and hence a series of power levels are associated with each patch, say ( which follow values proportionate to the patch size . Finally the covariance matrix is estimated by summing terms, where represents the appropriate manifold. In both approaches, we compute the rank of the covariance matrix to confirm the degrees of freedom. Figure 3(a) illustrates the example of the two patterns selected for receiving with a predetermined pattern ratio of order suitable for array broadside look. Figure 3(b) illustrates the case ( ) where the scan angle is −40 degrees. The MTR system uses 22-channel , 64 pulse (= ) system for each transmission. 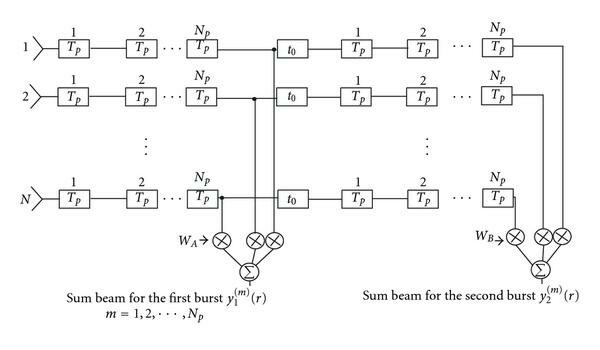 For comparison we consider the ideal scenario (Full STAP) where 64-pulses are transmitted and received via 22 digitised channels and full adaptive degrees of freedom (22 64) are applied to the processor by creating a 1408 1408 covariance matrix inversion. In practice this is not possible due to the lack of training data, so for greater realism we use reduced STAP with 128 adaptive degrees of freedom (i.e., ) for comparison of performances. The most important performance measure is described in (32). This curve, assuming a target of unit power, for the reduced STAP is represented by the symbol in Figure 4, and this is possibly the best curve achievable via any multiple A/D system. The results for the MTR are shown in the plots of Figure 4 for with the symbol and in the same plot with the symbol for the case with which corresponds to rapidly changing . In our examples total clutter-to-noise power ratio is 72 dB, and we have ignored the transmit tapering in order to increase the received clutter power levels to test the algorithms under severe clutter. These results simulate switching time . The performance of the conventional solution is denoted in Figure 4 as *-, which is the nonadaptive FFT-based solution currently available for single A/D phase array radar with the same parameters. This FFT solution performs equally well only in 2 or 3 Doppler bins which are clutter free, that is, the far end of the spectrum. An important observation is that reduced STAP with 64 pulses and MTR with 64 pulses per transmission invert a matrix of size 128 128, but MTR can only handle no more than 64-degrees of freedom, beyond which it begins to fail. For clutter free Doppler bins, we can theoretically prove that MTR-STAP maintains a processing gain of . Performance comparison of processing options. - - Dual Tx/Rx single receiver system with 64 pulses in each Tx/Rx (t0 = T; M = 4). ◦- dual Tx/Rx single receiver system with 64 pulses in each Tx/Rx (t0 = T; M = 12). •− Reduced STAP with 64 pulses, 128 adaptive degrees of freedom . -Ideal curve (standard STAP with 1408 degrees of freedom) with 64 pulses and 22 receiver channels. *-FFT solution (available via single A/D). The Figure 5 shows the plots of the filter for various incorrect values of by the symbol a, where . The plot for the actual value is set at shown with the symbol ( , scan). When the correct value is assumed in setting up the steering manifold, we achieve the best performance where the curve is horizontal, and achieve the value for the detection in noise which corresponds to several Doppler bins at the two ends. For the bin with severe clutter or look-direction clutter, the performance is downgraded severely; that is, the depth of the clutter notch at the mainlobe clutter Doppler value is very deep. Sensitivity to switching time error . •−Reduced STAP with 128 adaptive degrees of freedom ( . −−MTR-STAP single receiver system with 64 pulses (M = 12) using (incorrect values), − (true value). and refers to the absolute value of a complex number (see the appendix for the proof). Simulation study has shown that the formula in (36) always produces a 99.9% accurate estimate of the switching time for all look directions which excludes broadside. This result is tested using MCARM data. The US Air Force Research Laboratory, Rome Research Site collected a large amount of multichannel airborne radar measurement (MCARM) data . The size of the MCARM array's calibrated matrix ( ) is 22 129, where 129 is the number of possible beamforming angles available in azimuth. Other important MCARM parameters are as follows: transmit frequency = 1240 MHz, the number of coherent pulses = 128, pulse repetition frequency = 1984 Hz ( sec. ), and number of cells = 680 (0.8  sec pulses). In fact this gives us the pattern related to the last 6 elements of the array which would generally follow a uniform pattern to be the pattern ratio. Finally, we create the pattern buy convolving the two patterns to obtain which is a set of 22 complex numbers corresponding to the polynomial product. Finally has to be normalised using the constant . This way we use all elements for the second receiver which receives pulse numbers from 65 to 123. This gives remarkable results as seen in Figure 6(a) for the angle index 65 (broadside) and in Figure 6(b) for the angle index 106. The two receiver patterns and the pattern ratios . (a) broadside, angle j = 65, (b) 39.8384° off broadside j = 106. As an example, the angle Doppler map of the dataset numbers rd50153 and rd50575 is shown in Figures 7(a) and 7(b), respectively. These plots are algorithm independent, and we simply apply the Fourier Transform on mutichannel data for all 129 beams to Doppler domain. However, one may use the new algorithm to produce the same plot with less resolution (3 dB) when multichannel data is not available. One important point to notice regarding all the MCARM datasets is the fact that the clutter center has shifted from the zero Doppler value. 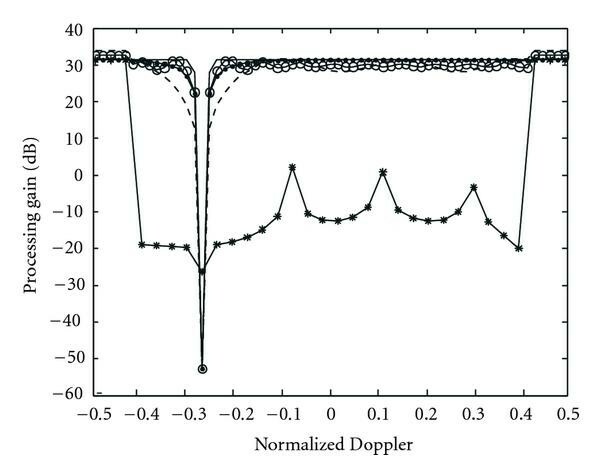 In other words, the Doppler value corresponding to the array broadside (with index = 65), we have nonzero Doppler value as clearly seen in Figures 7(a) and 7(b). Generally, this will not degrade the STAP performance. What this means for MCARM data sets is that we have the clutter ridge given by the format , where is the clutter center shift. As long as we impose the above formula for the clutter ridge in optimising (35), we can estimate the switching time as well as the clutter shift without having any knowledge of the value of which is in fact = 827.8619 Hz, and this knowledge is not needed to estimate as seen below. Let us assume that the switching time is unknown and we would like to estimate its value using the data set constructed for the MTR scenario. We can apply the result in (35) to estimate by using the formula . For the angle index 65 (broadside look, , we have which is an unknown quantity. Therefore, it is only possible to estimate the value of , for any guessed value of and then evaluate the value of the objective function in (35) which would optimise the processing gain. For some value of , we may find that the objective function is absolutely optimum or the processing gain maximum, at which point we have the best pair of ( . Such a plot is illustrated in Figure 8 for several data sets. 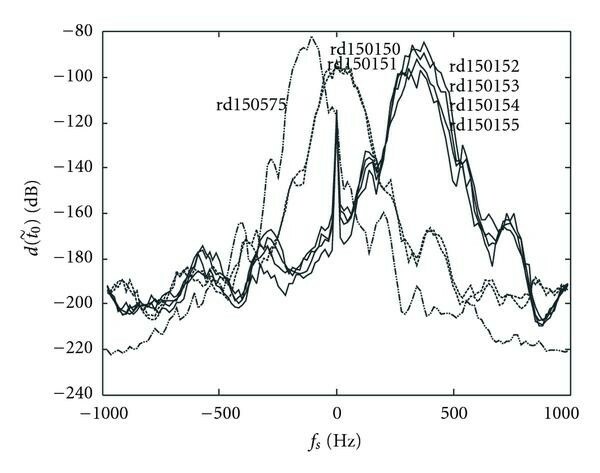 The data sets rd15015 ( ) all have very similar curves. The data set rd150575 has a very different clutter center (−108 Hz), whereas only two data sets (rd150150 and rd150151) have almost zero as the clutter centre to within 1 Hz accuracy. For the data set rd50151 we encountered a singularity due to the fact that the clutter center is zero. In this case one should steer the beam to the next position (angle index = 66), which is 0.9 degrees off the array broadside. The estimated missing pulse length ( ) is reasonably well estimated as illustrated in Table 1. Clutter center estimate for several MCARM data sets and the corresponding optimal switching time estimates. Plot of the optimal value of for every guessed value of . In order to compare (Figures 9(a) and 9(b)) with the multichannel (22 A/D solution), we use the reduced STAP using the channels 1, 2, , 21 to form one channel (using uniform weights) and then channels 2, 3, , 22 to form the second stream of data. The two data streams are combined to form the covariance matrix of size 128 128 using the first 64 pulses only (pulses 65 to 128 are discarded). This would make it the same size covariance matrix (128 128) which we used in MTR demonstrations. This would apply 128 adaptive degrees of freedom, which seems to be twice the MTR solution is capable of. Applying any more adaptive degrees of freedom to multiple A/D-based solution will not give us a fair comparison. The most important observation is that the MTR inverts a matrix of size , but it does not mean it's adaptive degrees of freedom is The simulation has confirmed that it is limited to . At this stage this can only be verified using extensive simulation. Another observation based on simulation data as well as MCARM data is that the order of pattern ratio is best to be around half the total number of sensors in the array. In our theoretical simulation, even though we use 128 128 matrix inversions for both MTR and beamspace solutions, we always validated this using covariance matrix of rank ≈ 60 via both continuous and discrete clutter models. As soon as the rank of the covariance matrix increases beyond 64, the MTR with 128 128 matrix solution begins to fail, and one has to increase the length of the pulse train accordingly. This also explains why MTR processing gain is marginally inferior when it comes to MCARM data. The reduced STAP solution is able to apply 128 adaptive degrees of freedom, while the MTR is able to apply up to 64, with the same size matrix inversion. 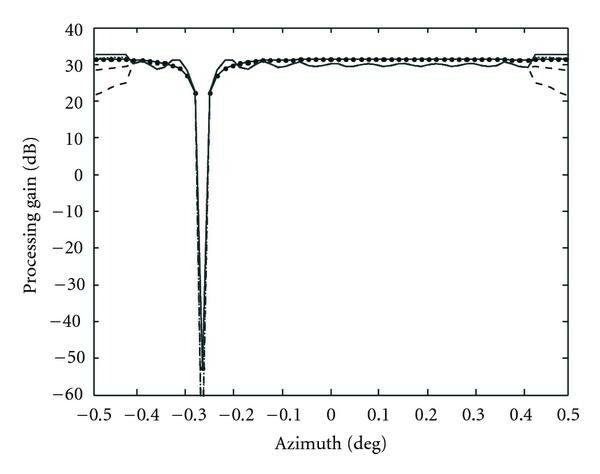 It is also important to notice the nonzero clutter centers where the clutter notch occurs in Figures 9(a) and 9(b). The solution presented in this study is much more robust than the multichannel multiple A/D solution when no jammers are encountered. This procedure can avoid all the complications involved in synchronising a number of A/D converters to achieve good results. This is not really a new STAP algorithm; rather, it provides a way to apply many standard STAP algorithms by constructing multichannel data out of a single A/D converter. Furthermore, it also makes it much easier to calibrate the array with only a single A/D. The simulation study has shown that the optimal configuration would be to make equal to around half the number of sensors in the array. The major drawback in the software approach is that we need twice as many pulses to maintain the same performance or else a 3 dB loss occurs in the Doppler resolution. It is also possible to extend the algorithm to null sidelobe jammers as well. This analysis is beyond the scope of this paper. The authors would like to thank the Defence Science and Technology Organisation (DSTO), Australia, for sponsoring this work. Comments by Dr. Leigh Powis of DSTO and the valuable suggestions by the reviewers are highly appreciated. which produces its maximum value at .